Horses are a great love in our house. Both girls love riding, but Lydia is head over heels in love with riding horses. She does regular lessons and has participated in three riding shows already and placed in all events she had participated in. Needless to say that we were very excited to get a chance to read the newest book from Circle C Milestones, Thick as Thieves. Written by Susan K. Marlow, Andi Carter is back in this series written especially for the early teenage crowd, ages 12 and up. 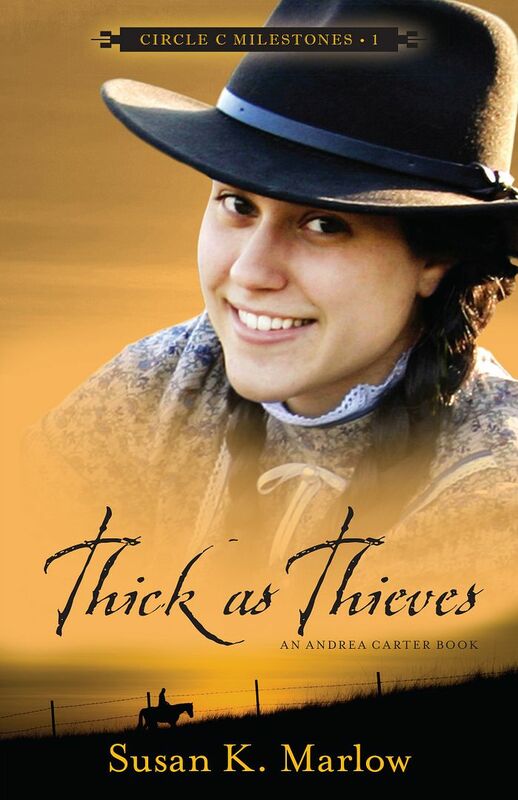 In Book 1, Thick as Thieves ($9.99), Andi Carter is growing up in the 1880s on a ranch with her family. Her mother wants her to be a lady, and all she wants to be is a horse woman. At 14 she just wants to live life the way she wants and she wants to run the Circle C Ranch. Andi's horse is about to give birth, but they had no idea what about the surprise that Taffy had in store for them. Her palomino was going to give birth to twin foals, a rare occurrence. This is so exciting. She is the talk of all the area ranches. All she wants to do is show her family how well she can train horses. Her mother steps in and realizes that Andi is letting her grades slip. So things become complicated as Andi is no longer allowed to work with her horses, but study harder. Then there is a new girl in school making it hard for Andi to finish the term with her grades raised. There is also worry about cattle being stolen from the ranch, which could bankrupt the ranch. We were also given a downloadable study guide that had comprehension questions to go along with our reading. I love having study guides to go with books, it saves me lots of time in creating questions for the kids. This study guide though goes a step further and includes vocabulary and language arts activities also. (Love covering as many subjects as possible in one lesson.) There are even some fun extras like crossword puzzles, math lessons and also science lessons about horses. This resource has been invaluable. This study guide is wonderful, it is something that I always strive to have for our kids with each book that we use for lessons. Lydia did attempt to read this story on her own, she is at a 3rd-4th grade reading level, and she struggled. So we ended up reading it together. We were able to read it over a few week period (we read it a few days a week, and not daily). Reading Thick as Thieves has been a great addition to the study unit Lydia is working on to go with her 4H project this year. Thick as Thieves is a great balance of being a fun read and also a book hidden with learning opportunities takes to the downloadable study guide. If you have a daughter that loves horses like we do, I highly recommend checking out Thick as Thieves and reading it together. We can't wait until the next book is available in July to continue reading this series. I admit, I am not always a great fan of teen fiction, but this was a great book. It also gave Lydia and I a book series to read together. You can see how the other members of the Schoolhouse Review Crew enjoyed Thick as Thieves in their homes by visiting the Schoolhouse Review Crew blog. Thanks for your lovely review. Yep, I'm with you. When I used Sonlight, I loved how books were more than just a read for fun. There was always something extra. That inspired me to create enrichment for all of my book series. Yes, Thieves would be a challenging read to someone at a third-grade reading level. Definitely a read-aloud (Sonlight style, LOL). But for reading on her own, Lydia might enjoy Andi's adventures when she is much younger in easier-to-read chapter books (Circle C Beginnings). They also come with all kinds of free activity pages too, at a much lower level.